I love Kristin Hannah, there I said it. There has not been one book of hers I haven’t loved and in fact she has written some of my favorites like The Winter Garden and Firefly Lane. I have been counting down the days until her newest book came out which was finally last week, YAY! And the day it came out I picked it up! This book is so vivid I felt as if I was in Alaska in 1974, I would really love to know how she researched so much of this book because it was so technical in many ways. This is a family drama that spans over 20 years of this family. It wasn’t what I was expecting in many ways but I loved it. I read this book really fast because I just had to know what was going to happen next. 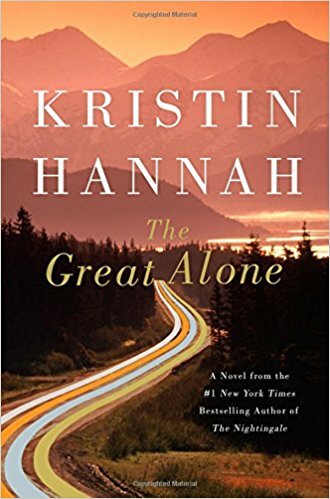 Kristin Hannah has said that she has already sold the movie rights to this book and I can honestly see not just a Book to movie with this one but a truly Oscar caliber film. The actors will have to be very vulnerable and once that is translated to screen I can only imagine how much I will love it. Since this is set in Alaska it is also the perfect Winter read, I highly recommend it!